It was with great sadness to learn of the passing of one of my personal favourite horses last Wednesday. Smart Strike was humanely euthanized on March 25 due to laminitis, at the age of twenty-three. He was a son of Mr. Prospector out of Classy ‘N Smart by Smarten. Smart Strike was a grade one stakes winner, a two time leading sire in North America, a half brother to world champion Dance Smartly and a grandson of the foundation mare No Class. He is one of six members of the No Class family to be inducted into the Canadian Racing Hall of Fame. When favourite horses pass away, social media internet becomes flooded with personal recollections and well wishes from the fans of the horse. In the case of this blog, I am no exception. The family of No Class has been perhaps the most productive and successful family in Canadian racing history. Smart Strike was a big part of this success. Smart Strike was a big, muscular robust bay who stood 16.0 hands. He was bred and raced by Sam-Son Farm in Milton Ontario, and he was trained by Mark Frostad and carried the red and gold Sam-Son colours to victory in six of eight races. His biggest moment on the track was his victory in the G1 Philip H. Iselin Handicap. He was also victorious in the G3 Salvatore Mile Handicap. He would be forced to retire when preparing for the Breeder’s Cup due to a condylar fracture. 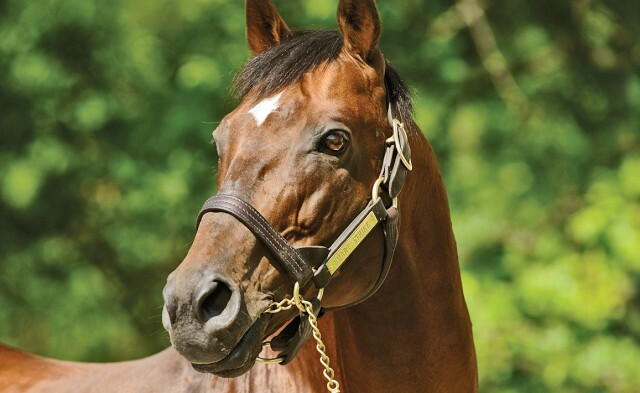 He began his stud career in 1997 at Lane’s End Farm in Kentucky, and stayed there until his passing. Today as we speak, Smart Strike has sired one-hundred and thirteen stakes winners, twelve champions of which some won multiple championships, four Breeder’s Cup winners and two classic winners. He was remarkably fertile and healthy up to his recent bout of illness which would cost him his life. He got off to a hot start with his first crop of foals which contained stakes winners Fleetstreet Dancer and Tenpins, the latter of which would emulate his sire by winning the Philip H. Iselin Handicap. His next crop would see two Canadian champions in the form of Soaring Free (2004 Horse of the Year) and Portcullis (champion older horse). More champions would follow in the next three consecutive crops, such as Added Edge (champion two year old in Canada), Eye Of The Sphinx (Canadian champion three year old filly), Gold Strike (Canadian champion three year old filly) who won the Woodbine Oaks in 2005, and English Channel (Eclipse Champion Turf Horse) who won the Breeder’s Cup Turf in 2007. In fact English Channel won six G1 races in his stellar racing career. Two years after English Channel was born, the most famous and successful son of Smart Strike would come into the world. Curlin is a majestic looking bright golden-red chestnut. Curlin would win $10.5 million in track earnings from sixteen starts, eleven of which were victories, two seconds and two thirds. He won the Preakness Stakes, Jockey Club Gold Cup twice, Breeder’s Cup Classic, Woodward Stakes, Stephen Foster Handicap and the Dubai World Cup, all of which are G1 races. Curlin was the Eclipse Award Horse of the Year at three and four, set new earnings marks when he retired and is now in the Racing Hall of Fame. He is the heir apparent to Smart Strike as a sire as he is standing at Lane’s End and is off to a very promising start to his career. Other notable offspring sired by Smart Strike are Fabulous Strike, Strike A Deal, Square Eddie, Papa Clem, Swagger Jack, Never Retreat, Centre Court, Shadow Cast, Furthest Land, Minorette, Lookin At Lucky a champion at two who would go on to win the Preakness Stakes at three, and My Miss Aurelia who won the Breeder’s Cup Juvenile Fillies. The daughters of Smart Strike are beginning to show that they are excellent stakes producing broodmares. Eye Of The Sphinx has produced Queen’s Plate winner Eye Of The Leopard, Noble Strike is the dam of Canadian champion three year old Inglorious, Run Sarah Run is the dam of First Dude, and Mining My Own has produced Canadian champion two year old and Kentucky Derby winner Mine That Bird and the ill fated double G1 winner Dullahan. Dullahan was retired on October 14, 2011 due to a bowed tendon and unfortunately died six days later of a ruptured colon. The sudden loss of the fine three year old was mourned in the various social media by his admirers and those who were close to him. Social media has been a very accessible way for horse lovers and racing fans in general to honour the lost heroes and heroines in the Thoroughbred world. Tributes and adulations along with pictures give us all a sense of closure when one of our favourites is taken away. Some tragically, some due to the advances of old age and some, as in the case of Smart Strike, from a baffling and as yet incurable disease. Laminitis and colic are the two most often heard killers of our equine heroes. The average life expectancy for Thoroughbreds is around twenty to twenty-five, or approximately one quarter of a human life expectancy. This means that one of the unfortunate realizations in being a fan of horses and horse racing is that we will likely see the birth and death of around three to four generations of favourites come and go. It is always sad to learn of the loss of any favourite horse, no matter the reason, so we keep them in our memories and celebrate their achievements and lives. There are many of past memorable Thoroughbreds still revered in books, on-line sites such as this one, and social media web chat rooms that keep the famous names in the minds of racing fans. Of course one only has to look at the pedigrees of Thoroughbreds to see many of these famous names of yesterday as the ancestors of the new favourites we fall for today. 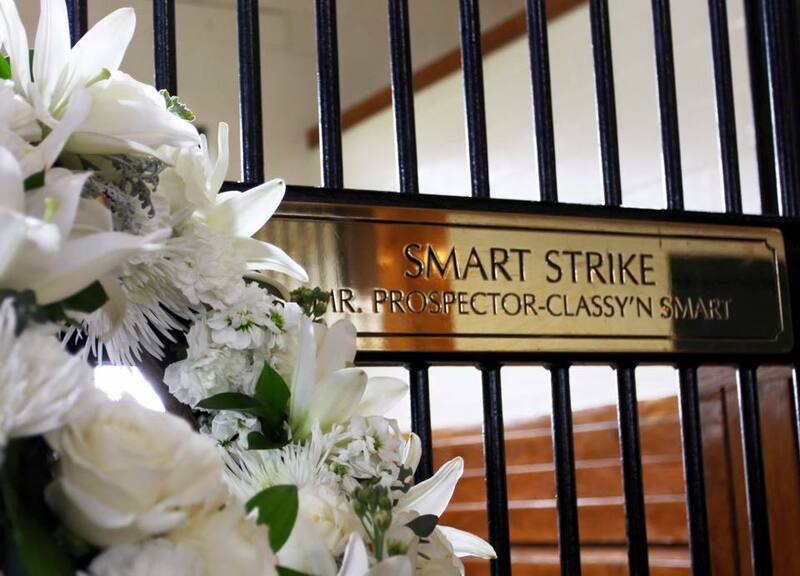 I will miss Smart Strike, not because I knew him closely, but because he was a great horse from a great family of horses that I have cheered for since I saw, and fell for, his dam Classy ‘N Smart when she won the Canadian Oaks. His “uncles” Grey Classic, Regal Classic and Sky Classic I watched at Woodbine become champions. I was also lucky enough to see his half sister Dance Smartly conquer the very best of her generation to become the undisputed Queen of Canadian racing. I have watched Dance Smartly’s son Scatter The Gold win the Queen’s Plate and her daughter Dancethruthedawn win both the Woodbine Oaks and the Queen’s Plate. I watched and cheered for Soaring Free during her marvellous career and marvelled at Curlin, English Channel and Lookin At Lucky because they were not only great horses but were sired by Smart Strike, the grand horse from my favourite Canadian family of Thoroughbreds. Rest in peace big guy, you are dearly missed by us all.